Butter 6 soufflé dishes. (8 ounce 4″ wide x 2″ tall) Place strainer over medium saucepan. Press raspberries (except for 1 container fresh) through strainer, scraping the bottom often with wooden spoon. Discard seeds. Bring to boil over high heat. Cook until syrup is reduced by about half, or about 8 minutes. Set aside and cool to room temperature. Stir in lemon juice. Bring milk to a simmer in heavy medium saucepan. Beat egg yolks, 1/4 cup sugar, and vanilla in small mixing bowl with electric mixer on medium speed until thick and light colored, about 3 minutes. Mix in cornstarch on low speed. Add hot milk in a stream, mixing constantly. Pour custard into the saucepan in which milk was heated. Bring to a boil over moderate heat, stirring and whisking constantly, until very thick and smooth. Do not be concerned if it lumps slightly, as whisking will smooth it out. Transfer custard into a bowl and stir in raspberry purée, use one cup only. Place a piece of plastic wrap directly on the surface to keep skin from forming. Cool to room temperature. May be made several hours, or one day ahead to this point. Refrigerate if more than several hours and bring to room temperature before continuing. Preheat oven to 375°. Beat egg whites in a large bowl with electric mixer on low speed until frothy. Add cream of tarter and beat on high until whites form soft, rounded peaks. Stir in 1/4 of the whites into the custard to lighten it. (Use largest bowl to mix) Gently fold custard into whites until slight streaks of white remain. Do not overfold. Pour mixture into prepared soufflé dishes. Place soufflé dishes in large pan with about 1 inch of water. Bake for 25-30 minutes or until center jiggles slightly and soufflé is well puffed and brown. 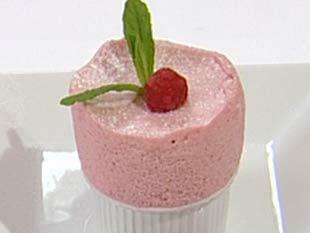 Sprinkle top with powdered sugar and serve, Pass raspberry sauce and fresh raspberries to top it off.